For more than 30 years, soil testing has been widely used as a basis for determining lime and fertilizer needs. Today, a number of procedures are used for determining everything from soil pH and lime requirement, to the level of extractable nutrient elements. And as the number of cropped fields being tested increases, more and more farmers and growers will come to rely on soil test results. But if soil testing is to be an effective means of evaluating the fertility status of soils, standardization of methodology is essential. No single test is appropriate for all soils. 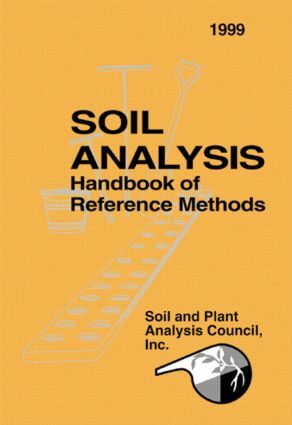 Soil Analysis Handbook of Reference Methods is a standard laboratory technique manual for the most commonly used soil analysis procedures. First published in 1974, this Handbook has changed over the years to reflect evolving needs. New test methods and modifications have been added, as well as new sections on nitrate, heavy metals, and quality assurance plans for agricultural testing laboratories. Compiled by the Soil and Plant Analysis Council, this latest edition of Soil Analysis Handbook of Reference Methods also addresses the major methods for managing plant nutrition currently in use in the United States and other parts of the world. For soil scientists, farmers, growers, or anyone with an interest in the environment, this reference will prove an invaluable guide to standard methods for soil testing well into the future.